WEST COLUMBIA, S.C. (CNS) — Mary Burkett never had formal art lessons. Drawing was something she resolved to try as a hobby in January 2017. 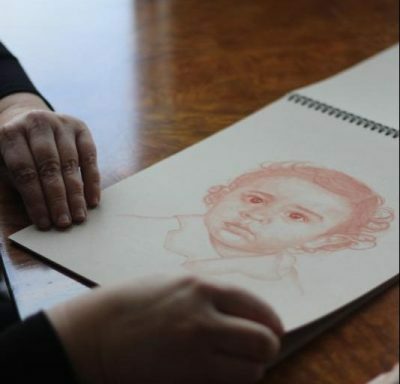 She decided to sketch the face of a little boy she saw in a black and white photo on the internet. To her surprise, Burkett was able to produce his image on the paper with amazing ease. The image is of a boy with a wide-open gaze, fair hair spilling from under a vintage-style cap cocked back on his head. He looks bemused, as if he was forced to pause for a portrait on his way out the door to play. It wasn’t until later that she discovered the photo was of a Romanian Jewish boy named Hersch Goldberg. He died at Auschwitz in 1944, one of millions of children who were victims of the Holocaust. Burkett had a visceral and emotional reaction to the innocent yet haunting face of Hersch. The fact that his life had been cruelly ended before it ever really began led her to search out images of other children with similar fates. She felt as if she knew Hersch after drawing him and she wanted to learn the stories of other children like him. Eventually, she decided she wanted other people to learn their stories too. It features Burkett’s sketch portraits of 25 other children killed in the Holocaust, as well as one of Janusz Korczak, a Polish pediatrician who ran an orphanage for Jewish children in the Warsaw ghetto and was eventually killed at the Treblinka concentration camp. That first sketch launched a journey she never dreamed of when she first put pencil to paper. She has displayed the collection at churches and synagogues, colleges and universities. Several schools have asked her to speak to classes that are studying the Holocaust and she has traveled halfway across the country to share her work with others. Burkett, who attends St. Peter Church in downtown Columbia, lived in Belgium for several years as a child, where she learned firsthand of the suffering and death that European Jews and other groups suffered at the hands of the Nazis. That perspective, and a lifelong love of children built through motherhood and a 40-year career as a pediatric nurse, likely are part of the reason her portraits of the children are so riveting. To look at them is to briefly feel as if you have touched a tiny soul. Their eyes, especially, reach out with a spark of life. Five-month-old Alida Baruch, who died at Auschwitz in 1942, looks like a Gerber baby. Fani Silberman, with dimples and tiny hoop earrings, has the twinkling innocence of a child movie star. Abraham Henselein, although he died at 6, already had an intense gaze. Perhaps he would have been a future scholar or national leader. Burkett said their expressions convey so much because they were captured in an era when photos were more rare than today. “Children weren’t used to posing all the time back then, so we get to see more of who they really were,” she said. Burkett said her skill can only come from God. As she is quick to explain, she had no formal training prior to that January day when she first started to work. Her artist’s tools are spare and simple. What she calls her toolbox is a Ziploc bag with a few simple items. She uses a pencil in a shade of reddish-brown called sanguine, and smooths edges and lines with cotton balls and swabs. 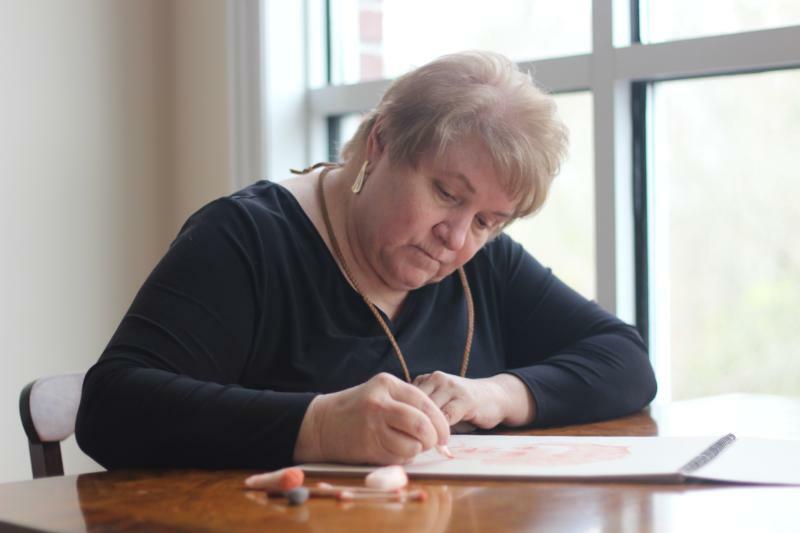 Burkett does most of her sketch work at a large table on the second floor of her West Columbia home, before a window where sunlight spills in on nice days and she can look out at a span of green hills and trees. Just as she did not expect the “Beloved” collection would exist a year ago, Burkett says she does not know what the future will bring. All she knows is that the children who reached out to her from photos have been given a new life through her pencil. Editor’s Note: To view the Beloved collection and learn more about Burkett’s work, visit www.belovedchildrenoftheholocaust.com.